It’s that time of year again – the bunnies and baby chicks are back at Jordan Photography. We are in a new seasonal location on the northeast side of Town Center Plaza next to the Barnes & Noble fountain. Visit us from March 15 to April 20, 2019. These sessions are for children ages 6 months (sitters) and older. 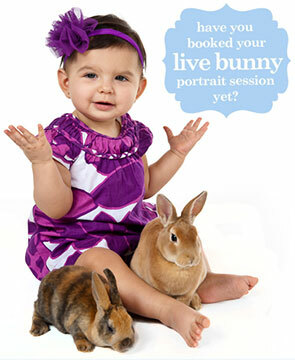 Bunny sessions on or before April 5th will receive photos by Easter. Orders will be ready in approximately 14 days from the order date. Capture your little one’s new spring outfit and record just how much they grew over the winter as they pose with real bunnies and chicks. It is always delightful seeing their pure excitement and the silly faces that arise when combining children with animals.